Chances are that your potential customers don’t realise how much they need your product and reducing this information gap is one of the biggest challenges of marketing. First of all, it is important to talk about what their problem is. You should do this before identifying your product or service as a solution for that problem and you should focus on talking about your products benefits. However, the question remains: how can you lure the people you want to talk to? This very important step is known as “lead generation” and you can learn more about how to effectively harness it through the example of a nutraceutical company based in the USA. They collected 6,310 new email addresses and 4,910 Facebook likes through the use of a unique sweepstakes, where they offered an extremely valuable and risky grand prize. Moreover, 25% of their subscribers actually became customers! Interested? 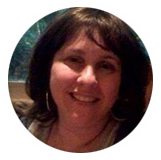 Then you should read the full story from the campaign manager, Linda Socher, a marketing consultant at Vita Sciences. People may like Facebook pages but they don’t visit them again. With Facebook promotions we could collect our subscribers’ email addresses, enabling us to have a strong connection with them. Also, we could generate more sales to our products through this method. Vita Sciences is a leading nutraceutical company in the USA. Its products help to restore people’s health and save lives with natural components. The company has multiple Facebook pages and websites for its products. One of them is Migravent, a product for people who suffer from migraines. The company wanted to build an email list for driving traffic and sales to its products’ websites, especially for Migravent which had a very old and less usable email list. However, the company was confident about its website, they knew that it was persuasive and well converting. They wanted to drive traffic from their Facebook page to their website. Collecting email addresses was more important than gathering Facebook likes for the company. For accomplishing this main goal they decided to use a 3rd party application that can capture email addresses. 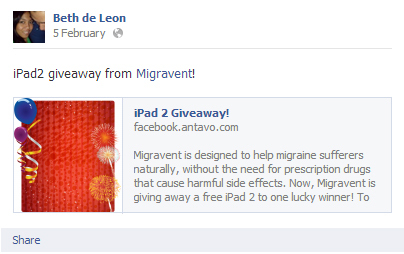 The company decided to run a draw on Migravent Facebook page, and they gave away a valuable iPad2 device for one winner. 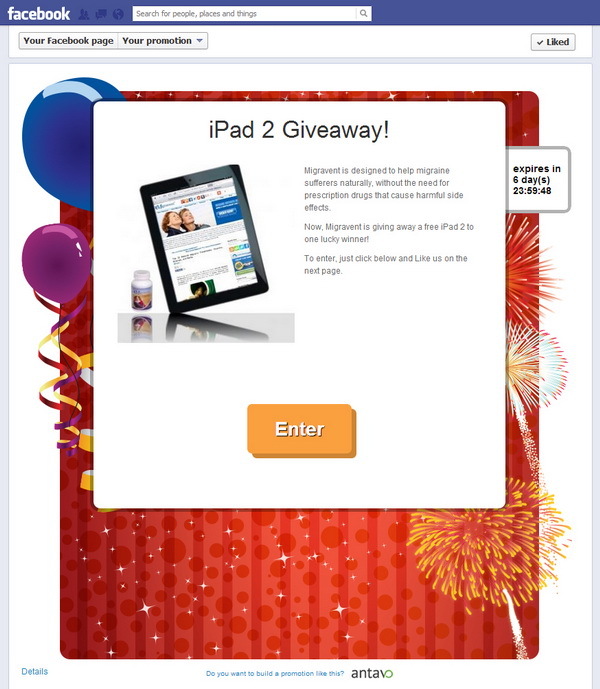 Giving away such a general and valuable grand prize like an iPad was risky, as the contest might have attracted prize hunters instead of potential customers, resulting in a poor quality email list. They said that 25% of the subscribers actually became customers as migraine is such a common problem - people often realize that they have symptoms after learning more on the site. Let’s see the components of their success. With a valuable grand prize the company attracted a lot of visitors to its Facebook site and was able to attract new entrants. During the 2 month long competition the fan base was boosted by 4,920 new likes. In order to strengthen Migravent’s recognizability they decided to put a bottle next to the iPad and a screenshot of Migravent’s website on the iPad’s screen. The subscribers were motivated to share the sweepstakes’ link, because it meant that they increased their chances of winning. They got 5 bonus entry points for each friend they successfully invited. A subscriber shares the sweepstakes link for bonus entry points. 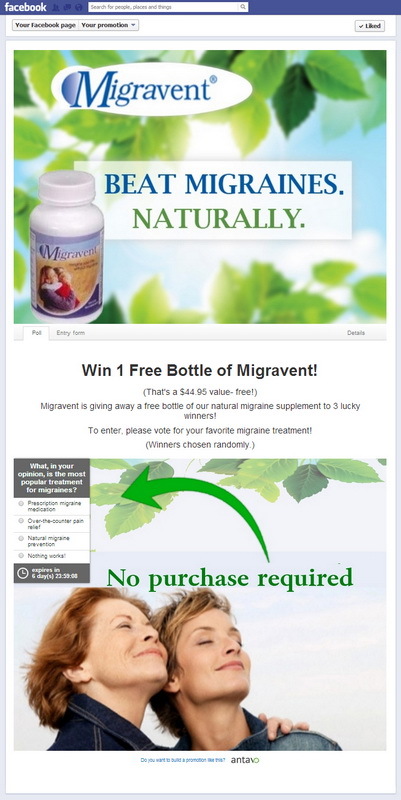 The company promoted the sweepstakes on Migravent's sister pages, on a Facebook group about migraines which was managed by them, and on Mom Giveaways whose audience is mainly consists of women and this site shares several authentic giveaways. 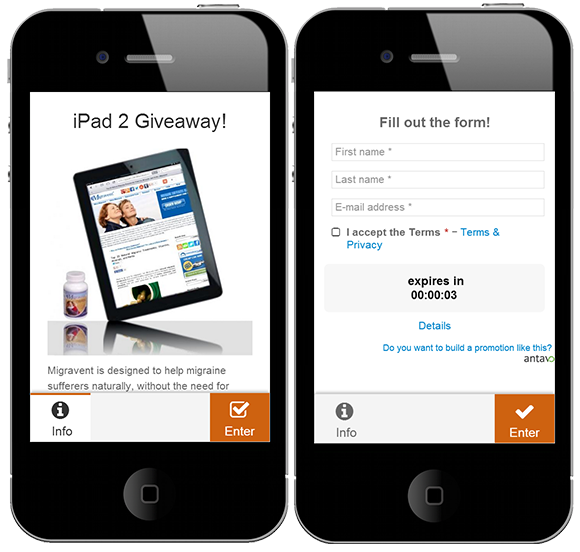 People could enter the sweepstakes from their mobile devices as well. The company highlighted it in their Facebook posts. They shared the mobile compatible link for the sweepstakes. The company emphasized the contest’s authenticity by informing the entrants about the status of the competition with call-to-action posts (multiple subscriptions daily were also honoured by extra points). They always attached the competition’s link. 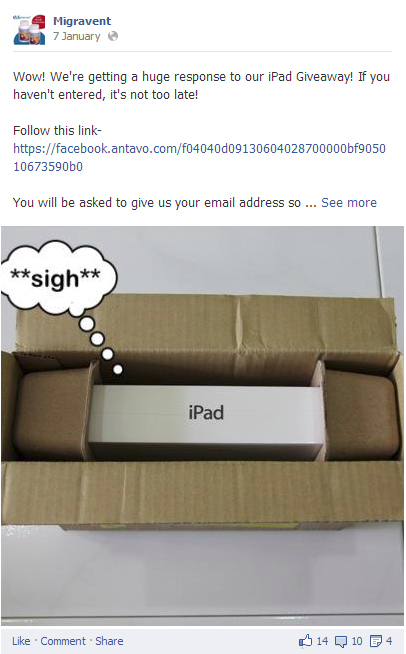 They posted an image of the grand prize in its actual ‘home’ awaiting its new owner. The draw for the iPad2 grand prize attracted a wide ranging audience. The company knew that among these visitors there will be “prize hunters” and others who are not interested in their product. That’s why at the same time they launched a poll for recruiting people who actually wanted to win the product they sell. At the poll entrants had to give their answers on a specific topic - in this case what was their best treatment for migraines. 3 winners were chosen randomly from the poll. With the draw the company got 10,928 subscriptions from 26,931 Facebook visitors; the conversation rate was 40%, which was a great result. From 10,928 subscriptions the company collected 6,310 unique email addresses. The number of subscriptions also shows that every person entered more than once for the sweepstakes. This would suggest that the promotion was good for engaging fans and increasing brand awareness. 25% of the subscribers actually had migraine problems, who became customers. This can be credited to the good comunication afterwards. The cost of one subscriber was $0,15 including the grand prizes and the cost of running the competitions. This shows that the campaign was extremely viral and cost-effective. 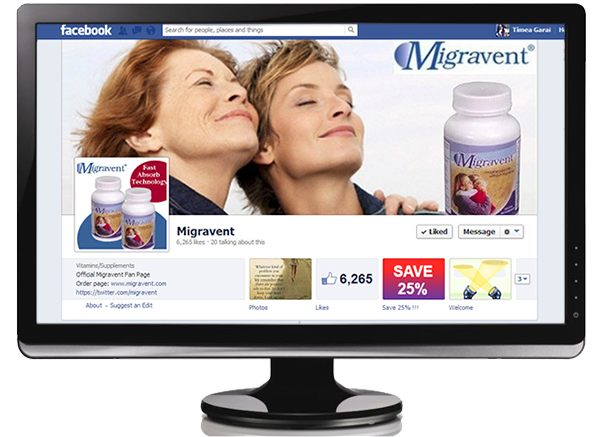 An extra 4,920 new fans liked Migravent’s Facebook page. 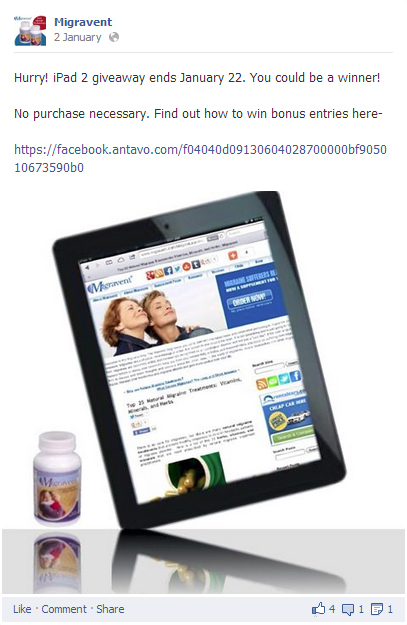 Vita Sciences is a perfect example of how to convert sweepstakes subscribers attracted by an exceptionally precious grand prize into paying customers through the use of good persuasion. They collected more than 6,310 unique email addresses at a very reasonable cost, who they can subsequently add to their newsletter list. Antavo’s platform was so great! Everything looked good and easy to integrate. 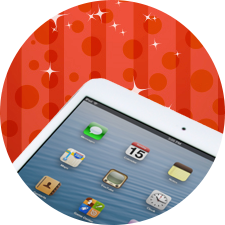 The personalization was also good, the pre-designed templates were easy to handle, you just needed to upload an image. I liked everything about it! This case study is based on an interview with Linda Socher, a marketing consultant at Vita Sciences.